A snippet from my other career as an architect. A ribbon-cutting ceremony was held recently for a state-of-the-art career and education complex at the California School for the Deaf in Riverside – a project designed and managed by the DGS Real Estate Services Division Project Management and Development Branch. Staff and students have been using the new facilities since they were completed last fall. DGS is currently working with the U.S. Green Building Council to certify the project as LEED (Leadership in Energy and Environmental Design) Silver for schools. Your story has been judged and did not place in the 1st quarter of the Writers of the Future contest which was between 1 Ocotber and 31 December of 2014. 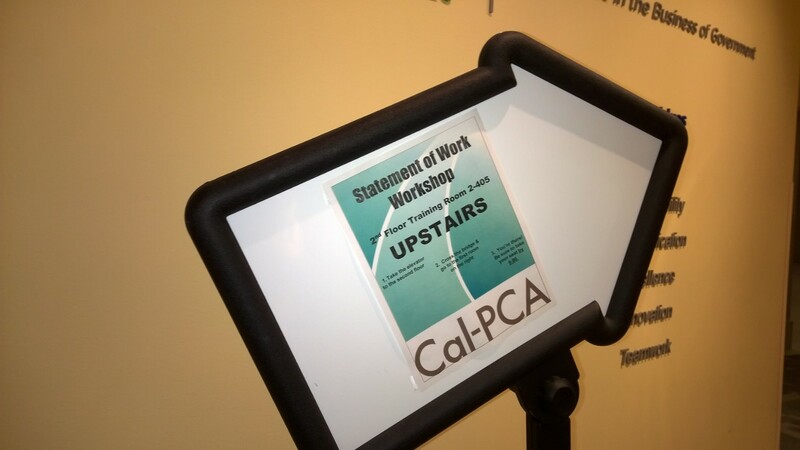 A workshop on a statement of work. Serious word gymnastics. If you’re holding a workshop on how to state your work, perhaps the work you’re doing isn’t really work. Perhaps you serve a force that transcends work. Most people who wander onto my blog have come here though stories I have published on Amazon, Smashwords or even Barnes and Noble. The stories have been there for a couple years now. They are reasonably priced, matching the bare bones publishing budget expended on producing them. To date, these are just expressions of my imagination and I have had no illusions of making loads of money. Amazon has recently had a change in policy lately and they no longer want to carry any owed balance to authors for too long and so despite not having requested it, they have recently sent me a check for all of the earnings my stories have racked up over the years. A whopping $13 worth to be exact. An underwhelming amount compared to what my day job pays me, but every penny is gratefully accepted. So if you wonder why I do this, it is because I have stories to tell even if few people are out there to read them. I write because no one should limit themselves to just one thing in life. At a very early age my son sees that I am a successful architect, and a writer. I hope he grows up with the same limitless view of what he can do. Congratulations! Your story received an Honorable Mention status for the 3rd quarter of the L. Ron Hubbard Writers of the Future contest. It was good news in my e-mail today. I hadn’t had a Writers of the Future honorable mention since the end of 2011. This is my first nod since David Farland took over as coordinating judge. This will be a story I need to shop to other venues now. Wal Mart vs Macy’s, where do you shop for clothes? Probably at both or if you say neither, the stores you do go to are likely to be bargains for some fashion moods and higher end for others. So why can’t we simply have the same choices in publishing and be done with the fight for supremacy? The state of the world of publishing right now has degraded into the business of bickering. On the one side are traditional publishers who want to go on charging the same price irrespective of the delivery method. On the other side is a large online retailer who is disguising their pursuit of profit behind the veil of democratizing the publishing world. Fact is there is a place for both and no place for boycotts or letter writing campaigns. In the end it is the consumers of literature who will decide what they want. People are not going to pay premium prices for electronically delivered content and people are not going to trust bargain based electronically delivered material if there is no way to be sure if it is a bargain or a bust. In the end I trust that it will be readers that find the happy medium. If there is a book or series of books I particularly like, I want to have a quality printed set and I am willing to pay for it. But if I want to experiment on new stories, I don’t want to have to pay premium prices to try them out. Sometimes the bargains turn out to be really good just like a buy at Wal Mart turns out to be a favorite. But if you know what you are looking for, like a favorite author who always delivers a satisfying story, you are more likely willing to pay more; just like you know you can go to Macy’s for some quality brands Wal Mart just isn’t going to have. As a simple author who wants to tell stories without the fuss of meeting marketing goals or working with agents and publisher demands, I am realistically happy to have Amazon and Smashwords available as an outlet for my works. I’d like to think that people who try my works out for the Wal Mart price are happily surprised by the bargain they get. Maybe I’ll build up a body of works and a trend of readers one day to attract the attention of a publishing house. I’d welcome the chance to have my works edited and illustrated by the pros, and if I show the promise for profit, we would both win in that case. Win win. Hopefully the publishing world will relax into this happy medium one day. After a year and a half I would have thought that my laptop/tablet from Samsung was too old to mater to Samsung. I hadn’t realized the seriousness of the grumblings over my Samsung 500T keyboard performance when I bought this computer. I was drawn in by the wonderful ways is performed as a tablet. Not long after buying the computer the troubles crept up. Then I broke the original detachable keyboard and the replacement never worked right. The only practical place to use the keyboard was sitting firmly on a table, which didn’t seem too fair because if I needed to use my computer on tables only I wouldn’t need an attachable keyboard. I could just use one of many, many better working Bluetooth versions. Still, the tablet form running on Windows 8 exceeded my expectations. Paired with an S pen it does everything I can do with a pad of paper and so much more. In tablet form, my computer has been the realization of all the things I wanted a computer to do. It goes everywhere with me in the office. I take notes, catch up on e-mails, check schedules, and I can pull up all of the cloud based documents for my construction projects. With my sketch program I can create colorful renderings and sketch my ideas while keeping an ear to the long meetings I become stranded in. I bought a Windows phone that stays perfectly synced with my tablet. Pictures I take on the phone are available for me to share through the tablet. My internet favorites sync between devices. Add a favorite to my phone and its there for me the next time I use the tablet. Hand scratched notes taken in meetings can be e-mailed to the meeting participants before we leave the room. I have many I-Pad owners asking how I keep all these things synced and the simple answer is I haven’t abandoned the Windows platform that my State business is run on. People are often genuinely amazed at what I can do with my tablet. Then there was the BUT. A big BUT. The kind of but that haunted this unit’s stellar performance. It was the keyboard. Because it only worked when sitting perfectly flat on a table it wasn’t much use for all of the things a laptop is meant to do. No typing in my lap while watching TV. No typing on the airplane or on the go. Most of the time it was just a little annoying with the connection being broken with a mocking warning tone. Bee-boo-bee. But in the past few weeks it was worse. If I used the computer as a tablet and then plugged into the keyboard, nothing worked. Not just the keyboard itself, but the tablet. Taking it off of the keyboard was not good enough to set things right either. I would remove the tablet, but then the built in pop up onscreen touch keyboard no longer popped up on the tablet. The only remedy was to fully shut down and restart the computer. It was getting to be infuriating. I was fully out of love with the whole thing. Then something wonderful happened. Samsung finally produced a real software fix for the unit. It was the kind of thing everyone was clamoring for a year and a half ago. Owners like me pleaded on the Samsung help sites and in product reviews and despite the claims at the time, all attempts to resolve these issues with an update failed. I really was certain that if it couldn’t be fixed then, that it was a problem Samsung was never going to be able to fix. But with my computer now going downhill fast I made one more attempt to try the latest updates. If it failed, I was reserved to having to buy a new unit and I did not look forward to that pain. So I opened the SW Update program and started the update process. At first it looked like the update program was crapped out too. It spun one of those classic twirling graphics so long I had shut down the computer thinking it was stuck again. When I restarted the computer and then the update program that twirling graphic spun on forever. I abandoned the computer for half an hour unwilling to watch it die such a slow death. But when I came back the twirling was gone and the update was ready. Again the download itself took forever. Again I worried. But after some time and several software induced restarts, the update was done. My tablet was back to its former glory. It no longer hung up on auto-rotates. The pop-up on screen keyboard was back and working like it did before. I was mildly optimistic, so I went to the next level of testing. I added the dreaded keyboard. I was afraid that might freeze up the tablet again, but I had to try. It didn’t. I could disconnect and connect at will and everything worked. My attachable keyboard started right up when connected and the on screen pop up keyboard came back when I took the keyboard off. I was completely satisfied with the results before I realized something more remarkable was happening. Before, when the tablet was firmly locked onto the companion keyboard, the slightest jog disconnected the two. It did it with this stupid mocking tone as the keyboard communicated, then broke its connection with the tablet. Bee-boo-bee. Disconnected. Bee-boo-bee. Reconnected. It did this on the table too through my heavy fingered typing. The only way to end the mocking was to turn the volume down. But what good was that? Volume down meant no music playback while typing. What a drag that was. After the update, there was no more bee-boo-bee. I tried turning up the volume but it was already up. What? So I typed more, and more. Not on a table, on a pillow. On my lap, on the arm of a chair. I found I could type anywhere and no bee-boo-bee. No dropped keyboard. It just works the way it was supposed to. My computer is back. Oh happy day as one of my employees says. I am thoroughly amazed. Samsung has done the unthinkable. They have not forgotten their old product. Thank you for helping me fall back in love with my device. It was one year ago that I had a submission worthy story for the Writers of the Future contest. That story did not place at any level. I am of course very hopeful for my latest submission uploaded today. Lets hope this new story catches the fancy of the judges. Posted by Tom Wells in Force of Bureaucracy, Introductions. Here’s the most obvious observation with a bureaucratic force. The bureaucracy itself does not care about the mission of the group which forms the bureaucracy. Therefore the bureaucracy is only satisfied with the kinds of thing a bureaucracy needs. The number one thin a bureaucracy needs is validation through growth. It is the More Is Better principal. The most common example is in purchasing. At the end of a fiscal year there is a scramble to spend every last penny of a widget budget. Not because more widgets are needed to fulfill the mission, but because if the budget is not maximized the next year’s budget may be downsized to fit the under spending. This kind of logic only applies in a bureaucracy. It is the result of the Silo Principal (more about that in another post). The mission may not even need the widgets anymore, but the bureaucracy won’t know that for years if it is large enough. People are nothing more than another widget in the bureaucracy. This is the most insidious example of the More Is Better Principal. In a bureaucracy, power is gained through the amount of people there are to manage because the number one function of bureaucracy is management. A system based on management can best recognize success through the increase of the people needing to be managed. Promotion comes from adding more people who are being managed, therefore it is in the bureaucracy’s best interest to add more people to manage so there can be more upward mobility for the people needing to be managed. Why? Because More Is Better.